Sorry about the quality , though a German number plate is clearly visible. "II" is the code for Dresden, yes, that's the Lewy car #51137. Do you know the event where this photo has been taken? Considering the timing it must be Guggerberg, or? On 25 August 1935 was the Swiss GP at Bern. Hartmann started in in the main race, and NOT in the supporting "Prix de Berne" for 1.5 litre voiturettes. The same for the Czech GP at Brno, where also was a supporting voiturette race. I don't think that the organizers would have accepted Hartmann's entry for the GP class if his car would have been a 6CM. And by the way, based on my knowedge the 6CM was only introduced in 1936. Crosschecked this, and it is correct. The first 6CM was only an engine (#1530), sold to Hans Ruesch in March 1936 who installed it into his 4CS. The first complete car was #1531 which went to Gino Rovere in April 1936 (debut race Monaco). The 2nd 6CM (#1532) was kept as works car, and most probably this car was entered by Officine Maserati for Hartmann at the Eifelrennen in June. The other 6CM, driven by Trossi, must have been #1531. Hartmann drove a works 6CM then also at Albi in July, and at Livorno in August. In 1937 then Hartmann bought an own 1.5 litre Maserati, no 6CM but a 4CM. Chassis #1550 with engine #1549 was delivered in August 1937 just before the Prix de Berne. Later that year Hartmann also bought engine #2012, a 4C-2500 unit, probably for hill climbs. Hans Lewy's last race in his Type 51 was at the 1932 Avusrennen, where he crashed simultaneously with Count Lobkowicz but both cars never touched. Both crashes happened at well over 200 km/h, the Count died and Lewy came away incredibly lucky without a scratch. He never raced again to my knowledge. He must have returned his Bugatti to Molsheim. In 1933 the new Nazi establishments of the re-created ONS and NSKK did not issue racing licenses to non-Arians. Lewy, a Jew, who was a cigarette manufacturer, was able to emigrate to supposedly South America in 1935. Hans, the T51 was entered also later for the German GP, 1 x for Lewy with #16, and 1 x for Pietsch with #30. In the race it was driven by Pietsch, who however retired in lap 1. Seems indeed that Lewy stopped racing after the AVUS accident. I doubt that the car went back to Molsheim, because that would have meant considerable loss of import duties already paid. It would have made much more sense to sell the car locally. As it seems Hartmann was present at the Nürburgring, so possibly they closed a deal there. The fact that Hartmann drove the car in white color even in 1933, and with German registration still in 1932, may have to do with some legal tricks to avoid Hungarian import taxes, which also then caused the loan story. 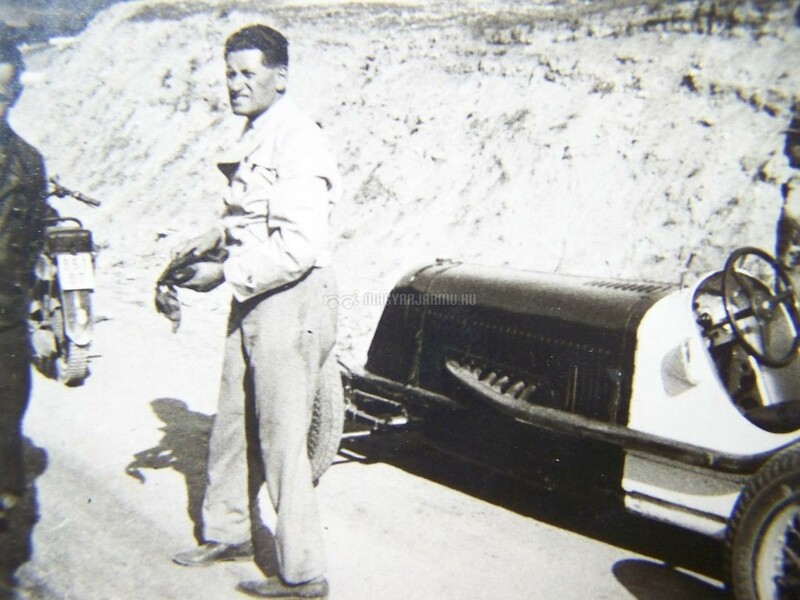 Michael - I just found out that Hans Lewy on June 26, 1932 won outright the 5 km Lückendorf hill climb with his Bugatti T51, then on July 3 once more was fastest car at the 5 km Würgau hill climb, again with the T51, beating Hans Stuck's SSKL by 3 seconds. On July 24 at the 11.9 km Gaisberg Laszlo Hartmann probably already had Lewy's T51. On July 24 at the 11.9 km Gaisberg Laszlo Hartmann probably already had Lewy's T51. This would confirm a deal made one week before at the Nürburgring. However, will be difficult to prove cause both cars - his T35B and the T51 - had 2.3 litres. Only photo would help. Hi there.. I have a report in SVENSK MOTORTIDNING from 1936 about the swedish winter GP.. where Laszlo H is actually interviewed.. especially about his trouble in getting to sweden. In short.. He drove all the way with a Bugatti as a towcar and his Mas 8Con tow on the horrible winter roads in denmark and sweden... In the race he made a pitstop on the first lap and the mechanics shut the engine off .. even though he told them they could not (it was compulsary) His engine oil was too thick and it wouldnt start again.... that was that..
"In 1935 Hartmann used a 1932 8C"
His still unsure about the capacity of the engine though - was it a 2.3 or a 2.5 liter engine. It would be very interesting to know from where he got the car, because it's one of the early models with the narrow 620 mm frame. It may be Ruesch's #3008, but I'm not sure. Gyula says that Hartmann only bought the body and chassis from Maserati and procured an engine separately with a capacity of either 2.3 or 2.5-liter. However, in 1937 he bought a special engine from Maserati, #2012, a 4-cylinder unit with 2.5 litres. This at that time was already a "grandmother", since 1934 it was mounted already to 4 or 5 other different cars. Up to now I have absolutely no idea what Hartmann wanted to do with it. For the GP class he had the big 6C-34 Maserati, and for the voiturettes his 4CM. So for what a 2.5-litre engine? May be he installed it in his 8CM for special purpose, was there a 2.5 litre class in local Hungarian hillclimbs? But perhaps that ties up some of the loose ends? I found some extensive reports on Hartmann's trip to Africa. If anyone is interested, I may copy and translate those. I know, I am slow, but at least trying to be helpful. maybe these little atricle quotes from the period SVENSK MOTOR TIDNING can clarify some details about Hartmann..
Hardest tested was the Hungarian Laszlp Hartmann, who started in good time from Budapest with a 3 litre world record Maserati, borrowed from the factory..(!) All went well up until Dresden, where the snow problems started.. but the problems in germany were nothing compared to what I, my Wife and my mechanic encountered later... etc etc etc.. It took me three hours to get out the railway station on the island of Rugen with the Maserati and the Bugatti towing it. We shoveled our way out a couple of yards at a time since ALL roads were snowed in. It took us three days to cover Rugens 50 kilometres and we arrived in Malmö on the morning of the 22nd of February completely shattered as there had been no sleep during the trip. However I was determined to take part in the race so I managed with the Swedish Automobile Clubs help get to Lake Rämen and arrived an hour before the start. But the rear wheels would hardly turn at all since the oil had thickened too much. Also it was very hard to get any life from the engine..
Where exactly was this photo taken? Grosvenor GP? I can't read the text below the photo. Yes, Grosvenor GP, Marius. Give me an hour or so and I'll email you a copy. Would his car be painted in H colours front to end : Red-White-Green ? Yes,I red everywhere,he raced the national colors this time. I have found a report in a czech newspaper for the 1932 Hohnstein Bergrennen (see here : http://kramerius.nkp...c.do?id=5863047 , hope this works...) crediting a driver called Levy, from Dresden, with 2nd best time behind Stuber's Bugatti. I think it may be in fact Hans Lewy, and as the event was held on september 18, if it is indeed him he raced for a little longer than previously thought. Frustratingly, the report makes not mention of his car. Edited by ERault, 30 March 2011 - 20:24. Christmas came early. At the Győr city archives there are three photo albums, showing the activities of the Győr Automobile and Motor Club, which existed between 1929-1939. Altogether there are more than 800 photos. The club participated at all major events in Hungary. So here are two, previously unknown photos of László Hartmann. Watermark shows our new site, magyarjarmu.hu which covers history of Hungarian automobile and motorcycle industry, motorsport, commerce and more. Thanks for sharing these newly discovered photos. The latter one is particularly interesting. If that was indeed taken at the Hungarian GP (I don't doubt it was, and it certainly isn't the Nurburgring), why does Hartmann have a 6CM with the race number he carried at the previous week's Eifel voiturette race rather than the 8CM he raced at Nepliget Park? Demonstration purposes, perhaps? The car is, as Rob says, a 6CM - still with Hartmann's Eifelrennen numbers from the previous week's race. It is definitely the car he used in the 1936 Hungarian GP. Film of the race shows he drove a 6CM, not an 8CM as various internet sites say. Pnegyesi - are there more photos of Hartmann on your new site? Not yet, but we're planning to do a feature on him. 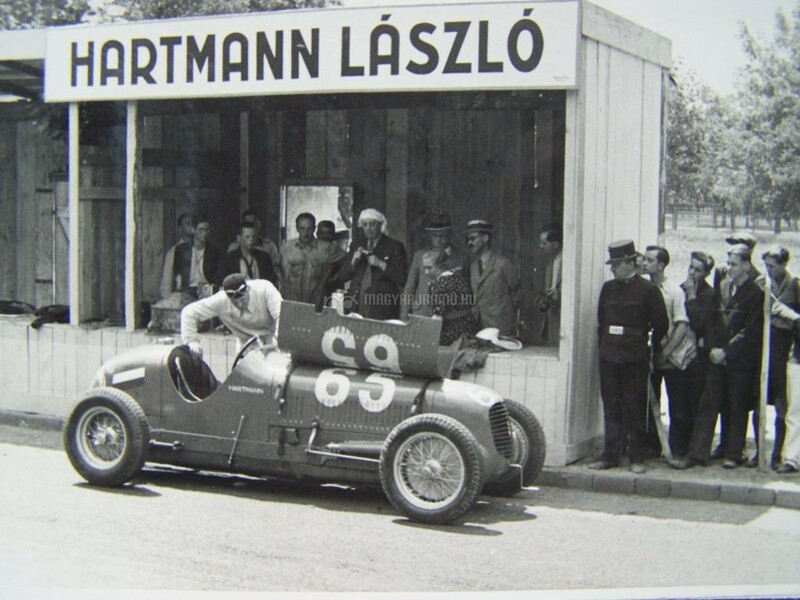 Interestingly, the car captioned as "1936 Hungarian GP" which is apparently the Eifelrennen car does not appear to be painted red, white and green. It has a hungarian flag on the tail but the car body is probably "rosso corsa"
Well, that would explain why the car is there. This was probably taken at the start of the weekend then. He probably didn't have time to re-number the car before arriving at the circuit. Does the film show that he drove a monotone (red) car, or one painted in the Hungarian colors? Edited by pnegyesi, 26 April 2011 - 18:25. Nope, me either. Wonderful video, but appalling crowd protection. Despite this version being issued by the Italian film bureau, this wonderful footage is probably of German origin. Indeed I think it turned up a few years back on one of the Audi VHS tapes. I was amused when I first saw it that for 90% of the film only the German cars are featured. Only in the last few scenes do we see the Alfa as the director realises that this is not going to be a routine German victory. The relevant Motor Sport has Hartmann as the winner of the 1935 Dobogókő Hillclimb. According to that article, he was followed by Biré and Singer, both on Alfa Romeos. Anything on these two drivers ? He died during the 2nd World War in 1943. There is not much known about Imre Singer, who bought Delmár Walter's old racing Steyr in 1931. He raced the Steyr in 1932, then a Bugatti in 1935 (BTW 1935 Dobogókő race the entry list features him in a Bugatti), an MG in 1936 and a Skoda in 1937. Edited by pnegyesi, 10 July 2011 - 18:23. Here is a photo of a gentleman the entry list called Johann von Biro, from Budapest, racing his Alfa 8C 2300 Spider at the 1935 Grossglockner Bergrennen. It is apparently one of the very few 8C 2300s that escaped Simon Moore in his wonderful book. Hartmann competed in the Monte Carlo Rally in 1929, 32 and 34. Does anyone know if he competed in the event in any other years? It's been 75 years, since Hartmann died in a racing accident. In 2018 it will be the 80th anniversary of Hartmann's death. We started some preliminary work on putting together a book on his life. We found a copy of a 94-page photo album in Toronto, depicting his racing career. Unfortunately it is only a photocopy, but it is full of previously unknown pictures. I have received a request for photos of Hartmann's fatal crash - have any ever appeared?